A Supreme Court ruling in favor of Shaun McCutcheon would set the stage for totally eliminating remaining campaign-finance laws. It is tempting to think that there is only one issue hitting Washington these days: the coming apocalypse over a government shutdown and a possible default. It is, to be sure, the Big One, and it should dominate our discussion and analysis. But there are many other issues looming out there that deserve broader focus and attention. One is the farm bill, a case study in dysfunction and chaos over the past three years which has devastated farmers hit by the most significant drought since the Great Depression and which, if unresolved by the end of the month, could cause milk prices to skyrocket, among other things. A key part of that dispute is the most punitive, cruel, and hypocritical action taken by Congress in years: the move by the House to slash food stamps in the face of a continuing stagnant economy. Such action would leave hungry millions of Americans, including children, despite the fact that their erstwhile breadwinners cannot find work. In the process, the move would also strike down state waivers for food stamps in favor of a rigid work requirement, without providing any funds for work training. House Republicans, led by Majority Leader Eric Cantor, pushed this plan as a way to cut government spending — even as he and his colleagues voted to keep in place generous taxpayer subsidies for multimillionaire big farmers and billionaire farm conglomerates. Government spending is OK, apparently, if it is for fat cats and contributors, just not for poor people. Another issue, which is my main topic today, is less about Congress and the executive branch, and more about the other branch — the Supreme Court. On October 8, the Court is going to take up the next big campaign finance case, McCutcheon v. FEC, a challenge to the overall contribution limits for individual donors to candidates and parties, limits that were institutionalized in the Buckley v. Valeo decision in 1976 that undergirds Court jurisprudence on campaign finance. McCutcheon refers to Shaun McCutcheon, who has given a lot of money to Republicans and joined with the Republican National Committee to bring the suit. Their argument starts with the idea that Citizens United’s reasoning — that limits on independent spending by corporations violated the First Amendment — should also apply to limits on what individuals can contribute, in the aggregate, to candidates and parties. Undergirding the argument is the idea that since the Citizens United ruling, parties and candidates have been put at a disadvantage compared with corporations, other groups, and individuals who are allowed to flood political campaigns with money through independent expenditures. Now, the argument goes, we need to compensate by freeing up the parties and candidates to raise more money. McCutcheon does not directly challenge the limits on individual contributions to individual candidates and parties, just the overall limits per cycle on what individuals can contribute to candidates and parties. As such, it can seem more reasonable on the surface: If I can only give $2,500 to any candidate, why shouldn’t I be able to give $2,500 to as many candidates as I want? Right now, individuals are limited in this election cycle to contributing $48,600 to all federal candidates and $74,600 to party committees and PACs. But here is the brutal reality if the Court agrees with McCutcheon: Presidential candidates, House and Senate party leaders, and individual members of Congress could then form joint fundraising committees with national and state party committees and leverage contributions from individuals into huge sums to support their campaigns — maximums of more than $1 million for individual presidential candidates, more than $3.5 million for committees formed by congressional leaders, and nearly $200,000 for individual congressional candidates. We know, based on past experience, that presidential candidates, congressional leaders, and candidates would quickly spring into action to create the maximum number of joint fundraising committees and maximize the number of $3 million donors — and, of course, every candidate and office holder would know who was ponying up the amounts. What if Congress then moved to outlaw joint fundraising committees (as if that could really happen!)? It would make the massive contributions a bit more cumbersome; donors (or their accountants) would have to write a lot of individual checks to individual party committees and candidates, instead of one or two big checks. The candidates and officeholders would still know clearly who had given the big bucks — and would open their office doors happily to them when they wanted or needed something from the government. 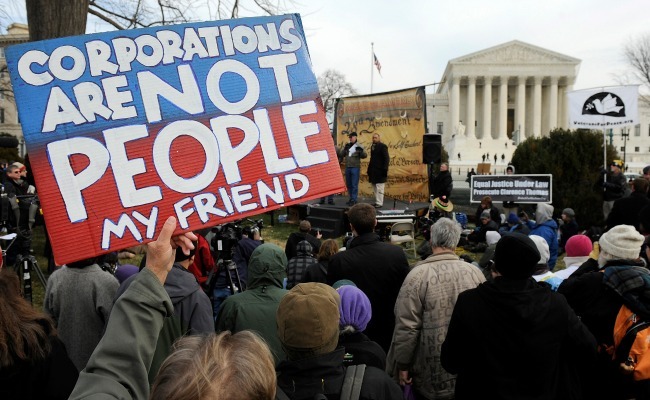 Justice Anthony Kennedy, in his Citizens United opinion, made the astonishing assertion that unlimited sums spent “independently” of candidates and parties by corporations could not possibly have a corrupting influence. But Citizens United went out of its way not to make the same claim for contributions to candidates and parties. The corruption standard for limits on individual contributions undergirds Buckley and every major campaign finance decision since. Ruling in favor of McCutcheon would knock the pins out from Buckley and set us down a path to obliteration of all remaining campaign-reform limits. In his confirmation hearing, John Roberts emphasized repeatedly that he would respect the previous decisions of the Court, would look to narrow the scope of decisions so that he could aim for 8-1 or 9-0 decisions instead of the frequent 5-4 divisions, and would bend over backwards to respect the role of other institutions, especially Congress. Citizens United demolished those pledges. A case brought on narrow grounds was abruptly broadened by Chief Justice Roberts and his conservative colleagues to include grounds that had never been initially asserted or briefed by the plaintiffs bringing the case, and the decision threw out one issued by the Court just a few years earlier, and effectively discarded decades of established law, jurisprudence, and practice over the appropriate role of corporations and unions in campaigns. McCutcheon will tell us soon enough whether Citizens United was a one-time occurrence or part of a broader, surreptitious plan to demolish the long-standing campaign finance regime and create a Wild West in politics, done in a few large incremental steps. McCutcheon would be step two. If it happens, expect steps three and four, which would eliminate all contribution limits and allow corporations to give directly to candidates and parties. And then brace yourselves for a political system that will make the Gilded Age look like the a golden era of clean politics.